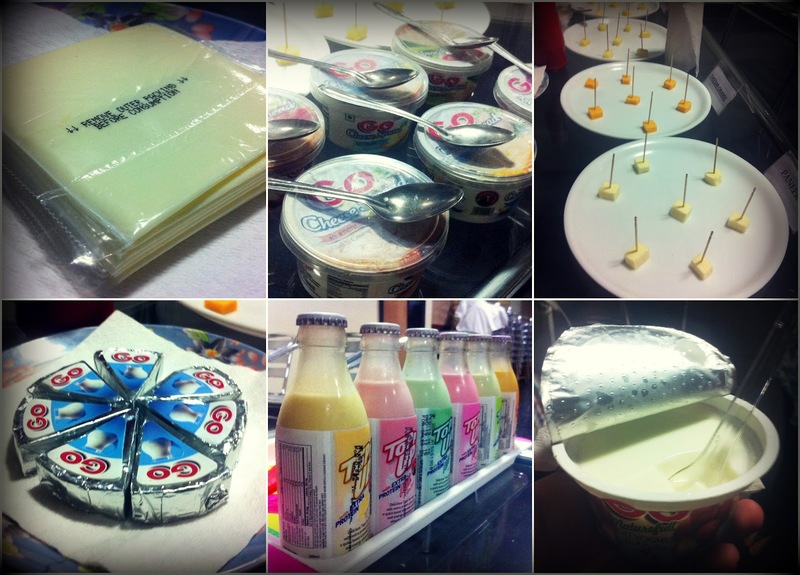 On arrival, we were offered a chilled lychee flavoured yoghurt, a product I had never tried before. I thought this was very interesting because as Indian tradition goes, you begin a new journey by eating sweetened curd. I highly recommend this product. We were then requested to remove any hand accessories and drop in our bags in a locker. Crisp white coats and head caps were given to us. 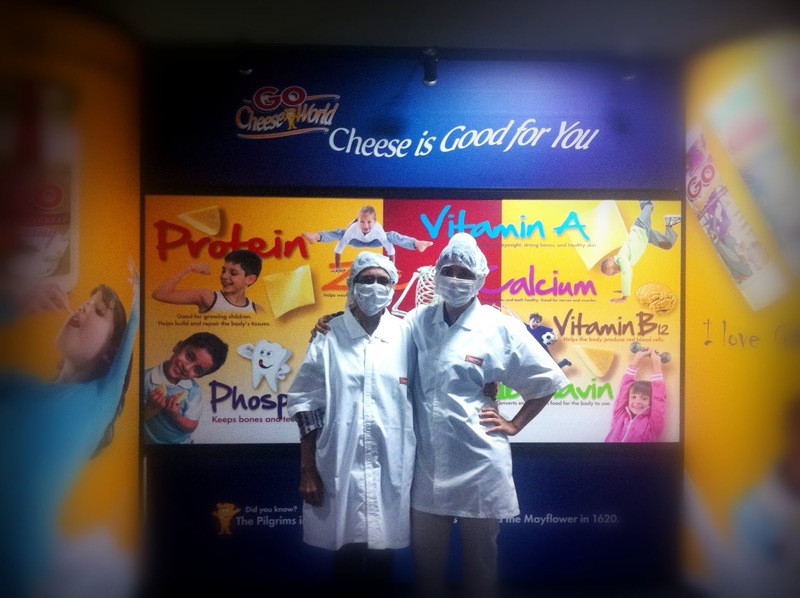 GO is the largest cheese manufacturing plant in Asia with a production capacity of 40,000 kgs of cheese. We were taken through the process of how the milk is heated and transformed into curd, how the whey is separated and how the different types of cheeses are made and packaged. The cheeses they produce are Montery Jack, Cheddar, Mozarella and Paneer. What struck me about the factory was how clean and sanitary every nook and corner was and how spotless and glistening their machinery was. Their operations support over one lakh farmers and their employee strength runs into thousands. We were taken into the cheese ageing section and three-storey tall storage sections where temperatures ranged from a shivering -8 degree Celsius to a brain-freezing cold of -26 degrees Celsius. It was heart-warming to also see local women employees in their packaging unit working happily and patiently. We were then treated to a cheese buffet - cheese blocks, cheese spread, cheese slices, cheesy pizzas and cheese drenched nachos! The hospitable server also cajoled us into sampling their varieties of flavoured milk Topp Up - out of pista, butterscotch, rose, mango and strawberry, the butterscotch and pista were my favourite. Well fed, we then progressed onto their cow farm which is the largest in India. There are approximately 3500 cows that are a cross breed of Indian and Holstein cattle (from Denmark). These are calm and intelligent cows. Here's an interesting trivia - cows love listening to classical and pop music! Whilst we were at the farm, the cows in their shed were enjoying some peppy Bollywood numbers on Radio One through loudspeakers. Each cow is numbered, insured and has a computer chip creating an entire database documenting its life, health, lactating capacity, mating history, location and movement, etc. Cow sheds are fitted with the latest in 'cow comfort technology' (yes, that's actually a thing). There are different sections for pregnant cows, sick cows and healthy cows and a temperature between 27 to 30 degrees is maintained. There's an army of workers dedicated to cleaning the sheds, which you can imagine whilst being such a smelly job, it is so important! The dung is then used by local farmers. Each cow is milked thrice a day and on an average produces 25kgs of milk per day. Few of their 'cash cows' sometimes even produce a whopping 54kgs of milk per day! We were shown the Rotolactor where up to 20 cows step onto a rotating platform and are milked with automated pipes attached to their udders. We may think this is a callous process, but as we were explained, this mechanized milking process is way better for the cows and even the manual process. And the cows making a chewing movement is a clear indicator of them being calm and happy. Mind you, in the Rotolactor room no music is played as the cows need some quiet whilst lactating. The cows also know that once they're done, they're done and detach the pipes themselves through a funny wiggle. The cow's udders are then cleaned and sanitized and once again given a medical check up. Once the green signal is given the milk it just produced then goes in for further processing. The cows then return (unguided) to their designated shed. Their walk back seemed excited and the reason for this we were told was that post lactation they are fed and the thought of food gets them excited! 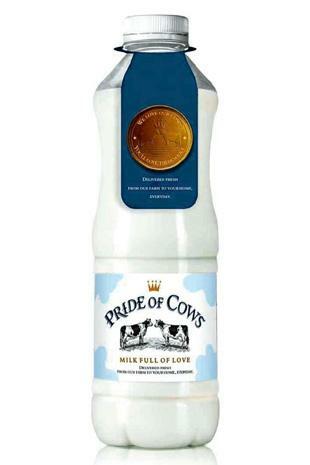 We were also given small shots of milk under their Pride of Cows brand. This is a farm to home milk where there is absolutely no human touch to the milk once it's milked from the cow till it's bottled. It's pure dairy goodness and a litre is priced at Rs 80 (evidently on pricey side). And so surprised as you may be to know but Pride of Milk has some exclusive clientele including Bollywood A-listers like Akshay Kumar. Here's a look into how the freshest milk is brought to your doorstep. The milk tasted fresh and creamy - you could instantly taste how different it was from a normal pasteurized milk. Pride of Cows is currently only delivered to select areas in Mumbai and Pune. What was really good to hear was that the company takes great care of the cows right from cradle to grave. Even after the cows stop producing milk, feeding them, taking care of their health and even burying them is all taken care of. - We weren't allowed to click pictures in most sections of their factory, but I think pictures speak volumes especially for marketing and promotional purposes and they should permit photography. But by all means they can set guidelines for the same. - The guide should speak louder, slower and with greater clarity. - They should consider creating a point of sale kiosk at the factory where post the tour, one can get the opportunity to purchase their products at prices slightly below MRP. - The experience should be made more interactive and this is where marketing and design should really step in. Perhaps, visitors can get their hands dirty and get the chance to touch, feel, smell the products and also engage in an on-site guided class of cooking with dairy with a designated chef. - They should open up their partnerships to all travel agents and position the factory tour among the list of things to do when in Pune; a well-oiled PR machinery here would definitely help! Their entire range of products are phenomenal however, they need to create a more robust distribution channel and grass-root level retailer engagement initiatives. Sometimes it is a challenge finding all their products at a local kirana. The cheese factory is also open for public visits and the only way to arrange for this is to get in touch with Heena Tours and Travels. You will need to have your own transport to get to and fro. I highly recommend the factory tour as a great educational experience for both adults and kids alike. I really liked your recipe milk products, its very tasty and we as a family enjoyed it. Thank you for sharing this recipe with us. I recommend it for everyone to try once its a very amazing.